Enervibe - Building a New Home? Choose healthy, non-toxic materials for the building structure, including formaldehyde and VOC-free products. Choose healthy, non-toxic finishing products for your home such as hardwood flooring, and formaldehyde-free cabinets. Incorporate proper ventilation into your home while the home is at a stage where it is easy to do so (mainly before the wall cavities are covered with drywall). Incorporate proper humidification into your new home. 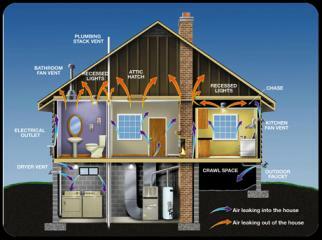 Make the home as energy efficient as your budget will allow. Possibly collect $1,500 to $10,000 in rebates from the Province of Alberta for Energy Efficiency. We happen to be in a very unique position to make your home energy efficient and healthy, by selecting natural materials and performing energy analysis. As Certified Energy Advisors with Natural Resources Canada, we model your home in HOT2000 energy software, and make recommendations to improve energy efficiency. You will be surprised at how reasonable the cost of this service is compared to the benefits to your health, comfort and utility bills. We are able to provide an Energuide Rating (Federal government program) for your home. Currently in Alberta, a new home that achieves an Energuide Rating of 80 or above will qualify the homeowner for a rebate of $1,500. Contact us today to see if your home qualifies for the rebate. A typical detached home, built to standard construction methods (no energy upgrades) will achieve an Energuide rating in the range of 70 to 75. With a few energy efficiency upgrades, this same house could achieve a rating of 80 or more.